Scholars Circle members Rick and Regina Roney, Jackie Inskeep, and Stephen Hicks. You can leave a bequest to establish your own named scholarship fund now or in the future. Planned gifts can be a great source of satisfaction and many provide tax advantages to you and/or your heirs. We encourage you to work with your financial advisor to determine which assets to give, the best time to give them, and the type of gift arrangement, or contact the Scholarship Foundation to help arrange a consultation with an attorney or financial advisor to help answer your questions. Have you already remembered the Scholarship Foundation in your estate plan? Please let us know so we can thank you. Click here to learn more about the Scholars Circle or contact Nicole Jones, Donor Relations Manager, at (805) 687-6065 or [email protected]. 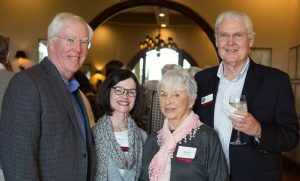 The Scholarship Foundation of Santa Barbara is a not-for-profit 501(c)(3). Tax identification number 23-7087774.